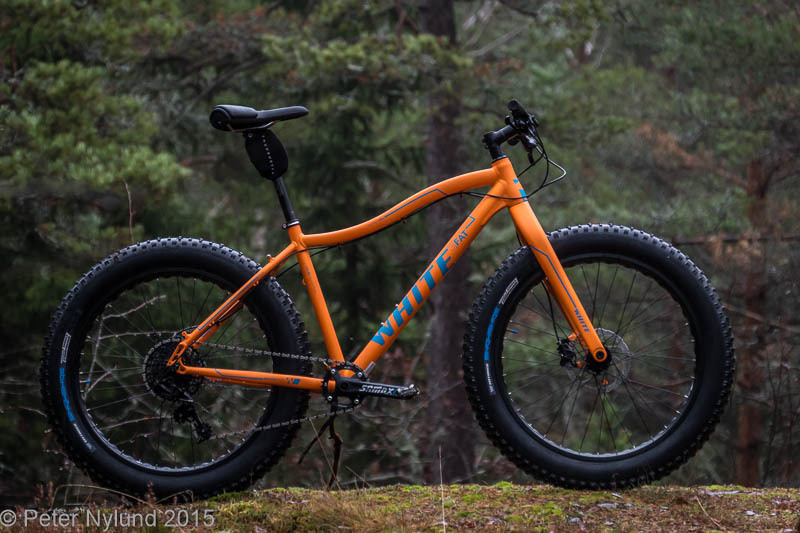 Yeti rides: A new fatbike! 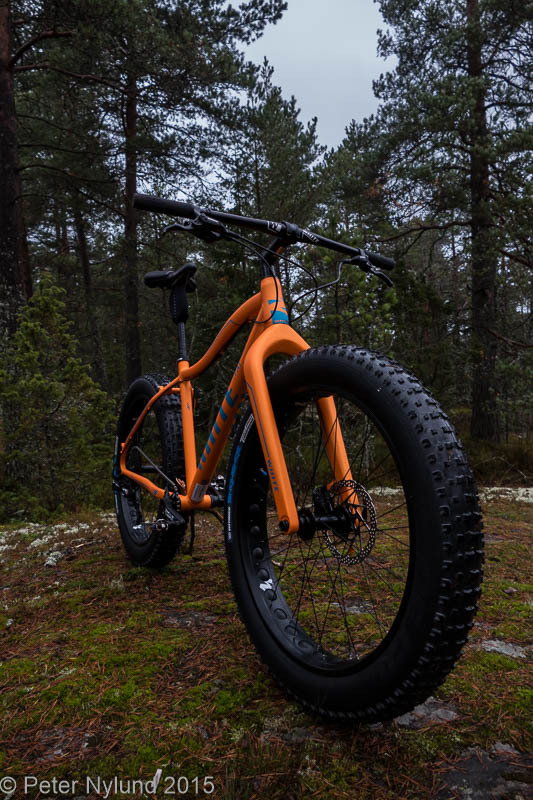 Why a new fatbike? I do have a 2014 Salsa Mukluk, which I've mainly had in 29+ mode with the 29" and 50 mm wide Surly Rabbit Hole rims and 29x3" tires. With the Bluto suspension fork this is a great setup for most situations. I also got a set of winter wheels for the Mukluk, with the 100 mm wide Surly Clownshoe rims, but the clearance with Surly Big Fat Larry on these rims was less than what I had hoped for. The tire clearance really only sufficed for true snow riding and I wanted more. At the same time, I've followed a discussion about even wider tires on MTBR with interest. This is the development I've been waiting for, and I made the decision to get a new fatbike when this new standard would become available. Unfortunately, it seems that the development currently is driven only by Espen Wethe from Nakamura Norway. Salsa and especielly Surly, which earlier have been the innovating force in the fatbike world have not indicated that they are doing anything at all currently. The current result of this development is the Vee Snowshoe 2XL 5.05 tire, which is noticeably wider than the current tires and fits a few frames of today, like the Salsa Blackborow and with some tweaks also the Surly Ice Cream Truck. I'm waiting for something bigger, though, before I start paying premium price for it. Enter XXL. I had checked out the fatbike of the house brand of the XXL sports retailer, White, and had found it to be a very interesting bike for a very good price. When XXL had a "super weekend" with 20 percent off everything, the offer was too good to resist. For 1059 € I got a full fatbike with reasonable components. As a comparison, the Salsa Blackborow frameset including hubs currently costs 1190 €. The White 3Fat Pro is the middle model in the White fatbike series. It has an aluminium alloy frame with a carbon front fork. The top tube is hydroformed, which I personally could live without. I've never fallen for the aesthetics of the bent tubes and it also slightly intrudes on the potential frame bag space. Still, the bike doesn't look bad, it is actually quite good looking. 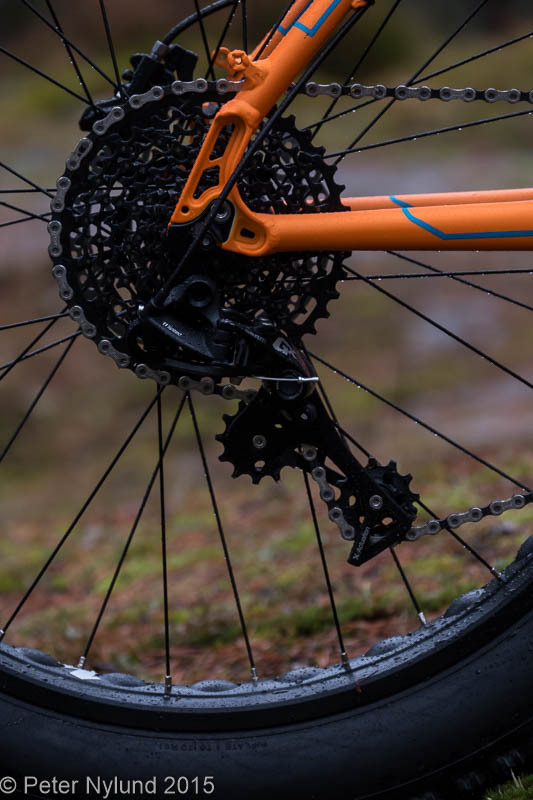 The component series is a reasonable mix of components, with the drive train for the most part being from the 1x11 SRAM GX series, which should be considered very good at this price level. The disc brakes are the Shimano entry level BR-M395, but I don't foresee a problem with that. The disc rotors are the correct size from the start, 180 mm at the front and 160 mm at the rear, something seen far too seldom. 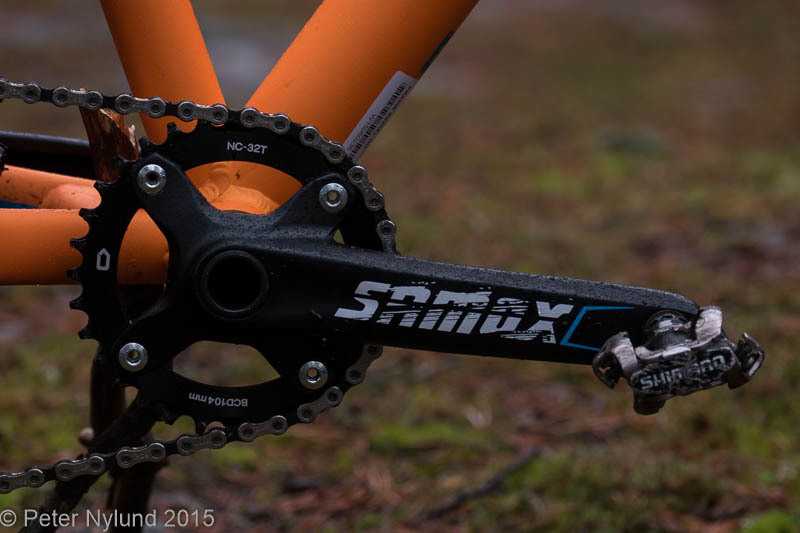 The crank set is the only real question mark: I've never heard of the Samox TAF 29. The rims and hubs are branded White, so it's hard to say what they are. The rest of the components are mainly branded White, and probably don't differ much from the entry level stuff of any other brand. (In the pictures the saddle post and saddle have been replaced with my preference, the Cane Creek Thudbuster suspension seat post and the Rido R2 saddle). 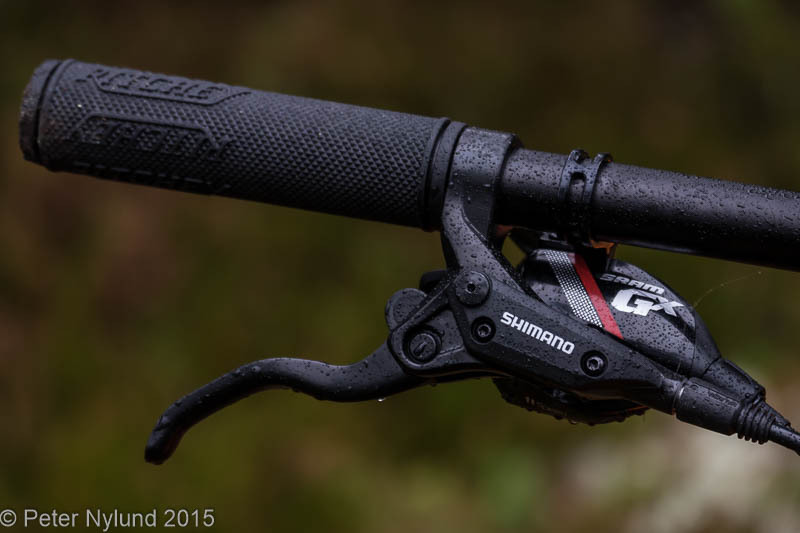 SRAM GX trigger and Shimano break levers. The grips will be replace with Ergon grips soon. SRAM GX 11-speed derailleur and an SRAM 10-42T cassette. The Samox crank set came with a 32T chain ring. 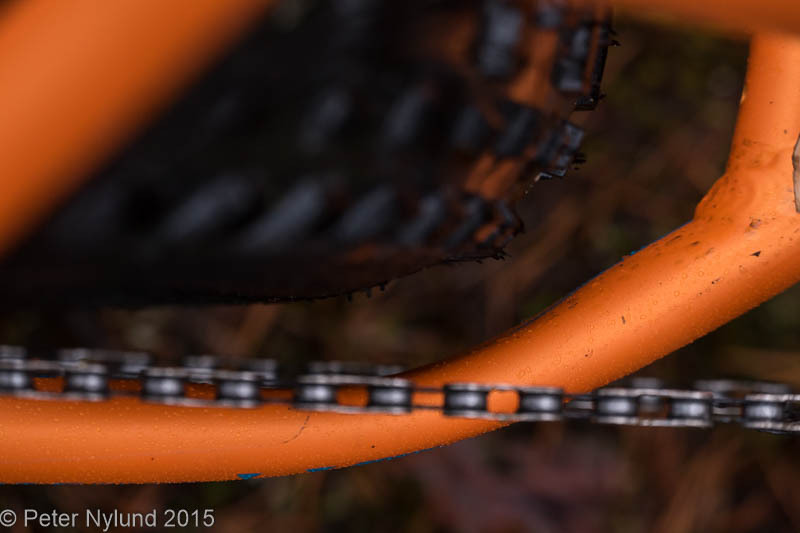 The chain clearance won't be a problem. The tire clearance remains to be seen. I tried it (not pictured) with the Clownshoe wheelset, and the Big Fat Larry tire on a 100 mm rim seemed to fit well, though I won't guarantee that the wider Surly Lou tire on a 100 wide rim will fit. (I wouldn't want to use it anyway. 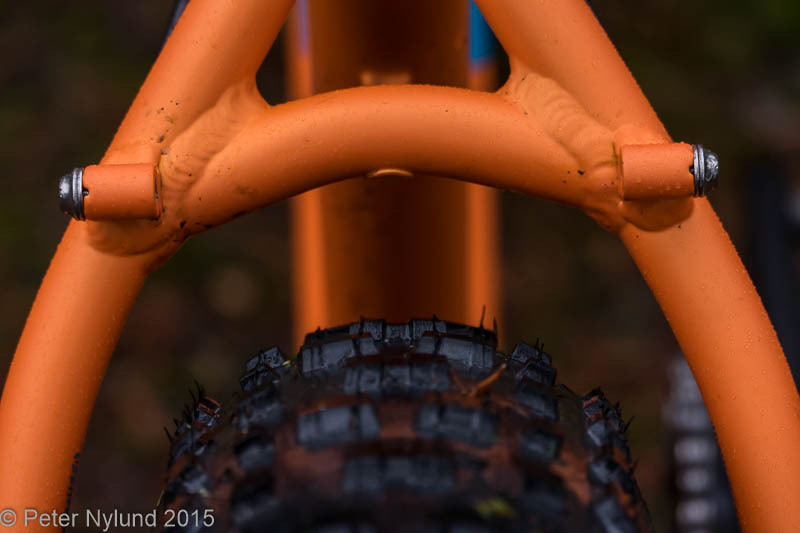 From my point of view the tires with really coarse patterns is the wrong development, since they cause even more damage to the trails than ordinary MTB tires. On the other hand, tires like Big Fat Larry treat the trails more gently that ordinary MTB tires. 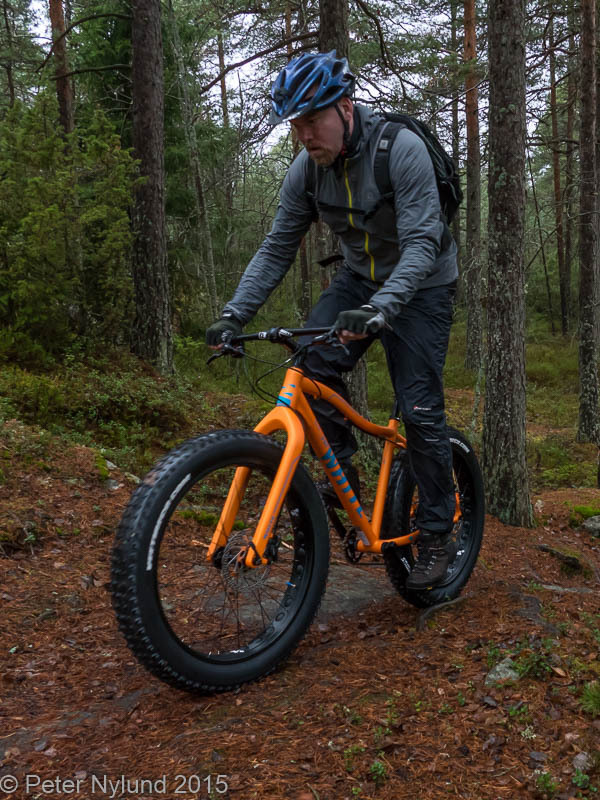 In my opinion, fatbikes should have as wide as possible tires, with a gentle tread pattern and a rubber composition giving good grip on wet surfaces). I did a one hour test ride in a slight drizzle. The tires were somewhat slippery on wet rock, but otherwise everything was great. The bike rode like any good fatbike and was lot of fun. The gearing ratios sufficed, but I do think that I will replace the 32T chainring with a 30T one, if or when we get a real winter. Some fine tuning naturally remains. The bike came with a 60 mm stem, which definitely is too short. I also found the handle bar to be too wide with its 740 mm, but maybe one can get used to it. My Mukluk winter wheelset will be rebuilt with the wider hubs needed by the White 3Fat Pro and I will also make a frame bag for it, but I do think that the bike is basically very rideable from the start, without having to replace components. To sum it up, this is really very much bike for the money. Compared to my Salsa Mukluk, which retailed almost twice the price two years ago, this is a better bike right out of the box. I don't see how Salsa and Surly can compete against bikes of this kind, unless they start innovating again.